Looking for fun things to do outside for the whole family? Check this out! This activity took me outside of my comfort zone – and almost didn’t happen because of that. But I am so happy it did! For this edition of our Exploring the 5 Senses series we explored the sense of taste – outside- with wild edible plants! I love nature activities for kids. We are outside in the wind, rain, sun, and snow (and we get snow!) 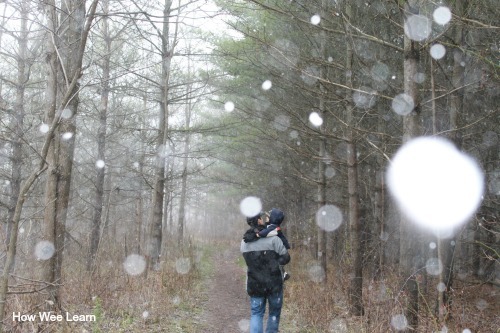 I love letting my wee ones explore all nature has to offer – the sense of sight? No problem. Sense of sound? Absolutely! But the sense of taste? This one made me uncomfortable. 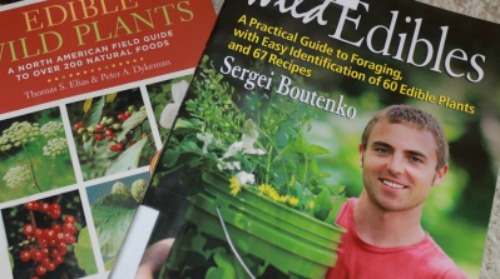 But after a few episodes of Survivorman, some library books on wild edible plants, and a knowledgeable hubby by my side – we began our adventure. The kids were of course very excited. But I made it clear we would not eat anything until we got home. For this first adventure on exploring taste in nature I wanted to bring everything home first and really look carefully and double check books. Wild edible plants sometimes look a whole heck of a lot like wild poisonous plants. 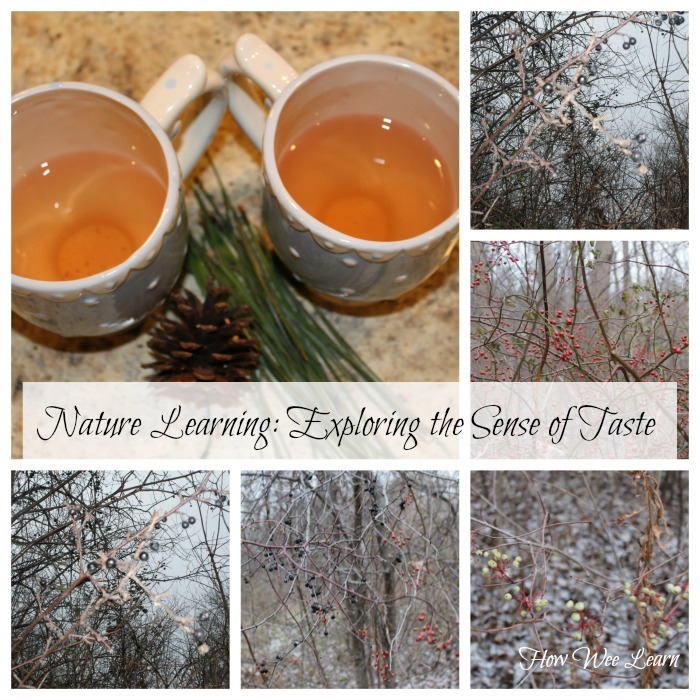 Interestingly, as we began our adventure – wild edible plants were everywhere! Even now in November. Madeline had found a neat recipe in one of the books for Pine Tree Tea – so that was one of our first things to gather. Easy enough – I know a pine tree. The berries on the other hand were tricky. 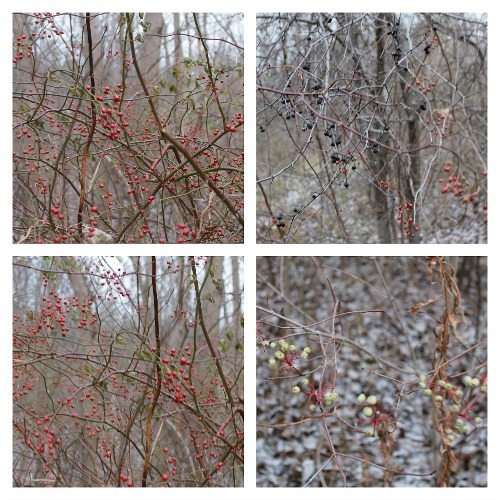 We took pictures of the trees and bushes and brought some berries home with us. We did not bring home any blue or yellow berries at all (as they tend to be poisonous). Real life learning at it’s best: the books were opened before coats were taken off. Berries were being measured and examined, oral language was filling the family room, talk of textures, colours, and consistencies. Truth be told – we only successfully identified two nature items. At least identified enough that I felt comfortable having my wee ones taste them. Elderberries and Pine needles. The elderberries were tasted raw 🙂 Quite the experience. And the Pine needles were made into a tea. We boiled about 5 cups of water and washed about 1 cup worth of pine needles. We broke of the little piece where they attached to the tree and then popped them into the boiling water and let them steep for about 10 minutes. Strain and enjoy. Simple! Apparently in the spring pine needles are very high in protein because of the pollen and can be added into smoothies for an extra kick – pretty cool! 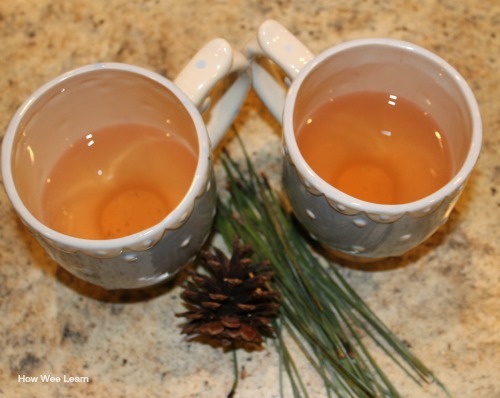 So how did my wee ones enjoy their pine needle tea? Well, they definitely explored their sense of taste! As Madeline said, it tasted pretty much like drinking a Christmas tree – and so it did. Fa-la-la-la-la la-la-la-la! Ooh, brilliant! I am like you and pretty careful about tasting things I don’t know. Thanks for the inspiration to get out of the comfort zone and sharing with Afterschool! So glad you liked the activity Natalie – I am certainly glad we had the experience! I bet you will be too! That is totally awesome! Although I can’t drink any right now, we will definitely go out for a walk and get some needles to try this out! Thanks so much. So glad you like it Janine! It was tons of fun for my family — and congratulations on your pregnancy!! How exciting! How cool! We were out on a foraging event last weekend as well. I think I’m safe identifying a couple of plants and trees now, but if in doubt I leave it alone. I do have a lovely wreath hanging on the door now, and I’m looking forward to some rosehip tea from the bushes at the end of the road. Ooh like this idea! Off to share it. Thank you for sharing Kierna!